Mortimer was born in Albacete (La Mancha, Spain) in 1973. 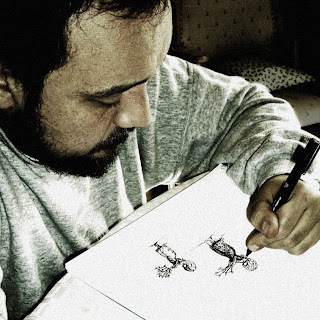 Graduated with a degree in information sciences in Valencia (Spain), he released several underground themed cartoons and collaborated in several amateur issues during the 90’s. After working at the TV for some years, he became marketing manager in a specialized video game franchise. He has recently left his job to focus exclusively on illustration and cartoons as he has been doing for the last 3 years. Mortimer is an active participant involved in artistic and cartoonists communities on the Internet being in close collaboration with the Microphones in the Trees community, one of the essential references on new trends in folk music. He also envelops his career as professional illustrator as member of the APIV (Professional Association of Valencian Illustrators). Last April, a solo exhibition was organized in the city of Albacete in order to show his recent artwork. Last months working with german cartoonist agency Toonpool.